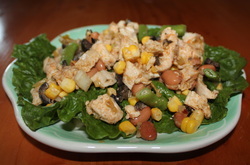 The next time you have leftover chicken try this fabulous salad. It is loaded with flavor as well as fiber, iron, Vitamins A, B6 and C.
Bring water to a rapid boil in a large pot. Boil corn and green beans until must tender, about 4-5 minutes. Set aside to cool. Cut corn kernels from corn cob using a sharp knife. Cut green beans into bite size pieces. In a large bowl, combine cooked chicken, corn, grean beans, tomato, garlic, onion, green chilies, olives, pinto beans, almonds and seasoning.